Way back in 1996 I was working as a Wildlife Biologist for the BLM in Coos Bay Oregon. I was part of a seasonal team that surveyed for an endangered sea bird called the Marbled murrelet. This bird feeds on fish in the ocean but then during the Spring and Summer flies up to 50 miles inland to nest and brood young. It was an incredible job that allowed me to spend my summers outdoors in the woods hiking around the Oregon coast range. Talk about a job that keeps you in shape. The hills of the Oregon Coast range are notoriously steep and brushy. The job was only seasonal though so during the winters I was left to fend for myself. The off-season of 1996 I decided to take a road trip and tour the southwest part of the States. I didn’t really have a plan, just a desire to hit the open road and take it one day at a time. Looking back on it now I realize how lucky I was to have had the freedom to travel so freely and to see the things that I was able to see. I spent time in California, Nevada and Arizona before finally ending up in Zion National Park where I met up with some friends. Together we backpacked into the Zion back country for a week of adventure and relaxation away from the rest of the world. We started our hike off the Zion-Mount Carmel Highway near Keyhole Slot and hiked south toward Checkerboard. After a few hours of hiking we reached a place that we dubbed “The Whale”. It was a large rock outcropping that looked like the back of a whale rising out of the earth and diving gracefully back into the rocky depths below. It was the perfect spot to setup camp. Not a single person was in sight. It was like the rest of the world ceased to exist. If you have ever journeyed off the beaten path and into areas seldom traveled by humans you know the feeling. At night laying in my sleeping bag looking up at the clear sky with the billions of stars shining back at me I couldn’t help but think that this is what paradise must be like. Over the course of several days we spent time exploring the area. 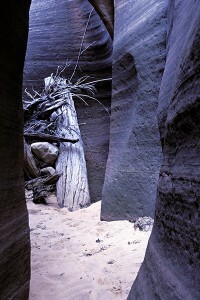 One of my friends had been to this area before and wanted to explore a slot canyon that he thought would be interesting. So early one morning with the sun rising in the sky and beginning to beat down on us we left camp and set out to find this canyon. After an hour of hiking through rocks we reached a spot where the canyon began. It was a bit of a climb so we used a rope to lower ourselves down into the shady depths. I was relieved that we had the rope to get back up if we needed to. The relief didn’t last long as my friend pulled the rope down after us adding “I sure hope it’s not blocked further down”. This should be interesting I thought to myself. Up above the sun was bright and warming but down in the depths of the slot canyon it was cool and chilly. We scrambled over rocks and slowly made our way down the canyon. At times we needed to wade through pools of chest deep ice cold water that left you grasping for air. It was exhilarating. At points the canyon became so narrow we had to take our packs off and turn sideways to get through. It was cold and dark with only a glimmer of light radiating down from the small crack way above our head. Finally after traversing pool after pool we came out at the end of the tunnel into the warmth of the sun. By this time it was mid-day and the sunshine felt great and quickly dried our soaking wet clothes. Looking at a topo map today I am guessing we were down around the upper reaches of Parunuweap Canyon. From here we still had further to climb down until we reached the floor of Parunuweap Canyon. It is here that I took this photo. The smooth rock walls were beautiful to behold. They seemed to reach up forever. Above the land was red and colorful but deep below in this crack into the earth the rocks were cold and blue. This was a long exposure taken with a Pentax Me Super on a tripod with Fuji Velvia slide film. I have no idea where we were. I suppose it is possible that we traversed Misery Canyon on our way to the East fork of the Virgin River. Wherever it was the memory of it will remain with me forever. I would love to get back and explore this area again. It holds lots of memories and I would love to photograph more of its beauty. It is one of the most remote and beautiful areas I have explored. Don’t pass up a chance to visit and if you do… make sure you bring your camera. If you’ve been hiking in this area I’d love to hear about your adventure. Be sure and leave a comment below. Matt, your story was inspiring. Southern Utah is also a very special place for me. I always feel a unique connection to the planet when I am there. Thanks for sharing! Great story Matt. I’ve heard it before of course but it never seems to lose its edge. When we do the National Parks tour, I vote for starting in Utah. 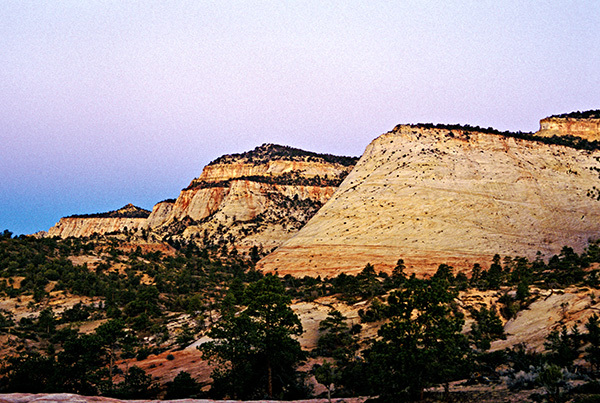 Between the National Parks and National Monuments we could eaily spend a year there! And of course your slot canyon photo is hanging on our wall right outside my office. So thanks for bringing a little adventure into my day! @Sage – We should go biking there. How awesome would that be? @Tracker – The National Parks tour is a definite go! Looking forward to it. Really been enjoying the Ken Burns compilation. We need to plan out the tour now. Previous post: Would you change your past?